Is “The Mill and the Cross” Historically Accurate? At last I was able to travel to a theater showing Lech Majewski’s “The Mill and the Cross.” Bringing to vivid life the 1564 painting “Procession On The Way to Calvary,” from the Kunsthistorische Muesum in Vienna, the film ostensibly allows us into the mind of Bruegel as he prepares to paint the work. There are many fine reviews of the film that you can find on the web. (I’ve including a few links at the end of this post.) Because of this, I’ll focus my review on the historical accuracy of the film based on what we know of Bruegel and his patron, Nicolaas Jongelinck. However, first let me say that I greatly enjoyed the film. (How can someone with a blog about Bruegel not find something to like in what is likely the first portrayal of Bruegel on the silver screen?) While it is impossible to know Bruegel’s thoughts while he was composing this painting, “The Mill and the Cross” offers one possible scenario. I found the film less compelling when it focused on Mary and Jesus. The story of the crucifixion has been told countless times on the screen, and I found little that was fresh in this retelling. – The costumes were very well done and closely mirrored those in the painting, as well as clothes that can be found in other Bruegel paintings. – While I enjoyed Rutger Hauer’s performance, he is too old to portray Bruegel in 1569, when Bruegel was approximately 35 years old. During the scenes of Bruegel and his wife Mayken Coecke van Aelst, I was pulled out of the film due to the jarring differences of their age and the fact that this does not match the historical record. 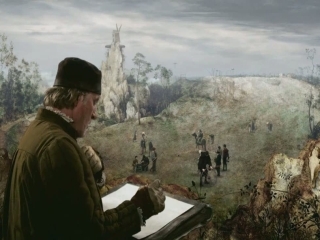 – The filmmaker did correctly portray Jongelinck owning a “Tower of Babel” painting by Bruegel, which can be seen in the background of several scenes set in Jongelinck’s house. We don’t know if it was the exact painting shown in the film, since Bruegel painted at least two versions of the “Tower of Babel.” The painting shown in the film is housed in the Kunsthistorische Muesum. – Bruegel had 6 children, 5 boys and 1 girl, in the film. This could be possible if Bruegel had 4 children that did not live into adulthood, since we know that Pieter II and Jan survived him. However, there is no documented evidence regarding the number of Bruegel’s children that did not survive. While there were some lapses of historical accuracy, the film is an entirely enjoyable exploration of the painting and of Bruegel’s time as we understand it today. We hope that it serves to introduce Bruegel to a new audience of viewers, who will then seek to learn more about the man and his painting. (1) “The Labours of Hercules, a Lost Series of Paintings by Frans Floris,” The Burlington Magazine, Vol. 107, 1965, PP 114 – 123. These guys are university professors? The wheel is well known as a device used for torture as indicated by the phrase “broken on the wheel”, where a person is tied to a wheel and their bones are broken, presumably using the spokes in the process. The movie’s wheel torture depiction seems like a variation on a theme. Not exactly a laughing matter. These two may be intelligent and learned, but they do not sound particularly erudite nor sophisticated about art history– something with which all film scholars should be well acquainted. I don’t think I noticed any ‘cavalry’ in this film, but I’m glad they appreciate the film!